Well, we were finally getting back to normal around here when my husband walked in the door at 10:30 yesterday morning; home from work after only two and half hours. He went straight to bed, where he remained for most of the day. I guess after nursing little r and I back to health, it was his turn to tackle this nasty stomach bug that made it's way into our home this week. Luckily this seems to be a 24 hour thing, so I fully expect to be back on track by tomorrow! We'll see how it goes. In the mean time...I've got a classic family recipe for you. 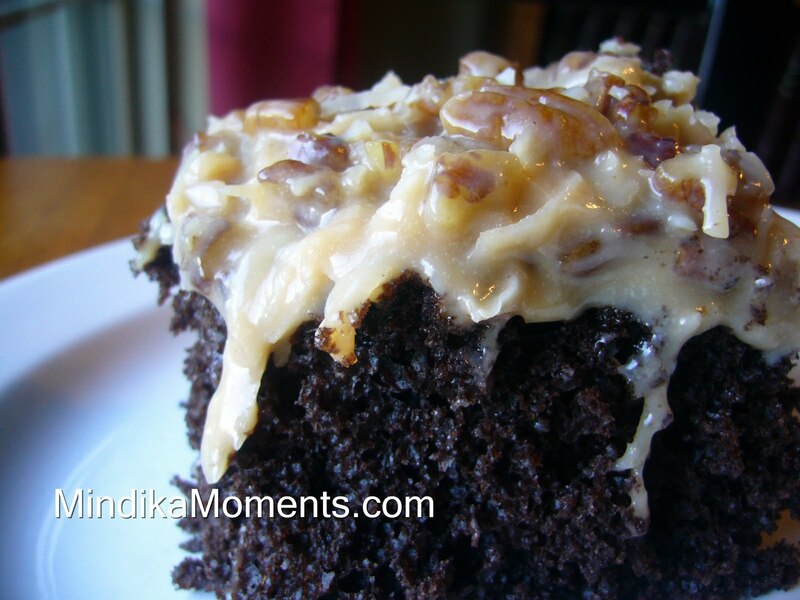 My grandma made the best German Chocolate Cake. The mere taste of the frosting conjures up images or memories of my grandma's kitchen; the way it smelled, looked and felt. German Chocolate Cake transports me to childhood; summer days at Grandma's house. It also happens to be my husbands favorite cake. We even had it as our wedding cake. Although it's really the frosting he loves. He actually prefers it with a fudge chocolate cake. I would have to agree with him. Once I tried it, I was hooked. This was his Father's Day request, so I of course obliged. I used a box cake mix, but if you're in the mood to make one from scratch this is my favorite chocolate cake recipe. Just leave out the cinnamon if you plan to pair it with German Frosting. 1. Melt the butter over medium heat in a large sauce pan. 2. Add the milk, sugar, egg yokes and vanilla. Bring to a low boil. 3. Allow to boil until it starts to thicken. Continue cooking for 3-4 minutes. 4. Add the coconut and pecans. 5. Remove from the heat and allow to cool. 6. Frost your favorite chocolate cake!